I want a nice, new set of encyclopedias. Yes, yes, I know – the Internet is one big encyclopedia. All the big encyclopedias are online. The CIA Factbook is online. A thousand country profiles are online. Heck, countries are online – we can even visit the official website of North Korea! So yes, I know, it’s all online. But…. While I spent a week in bed not feeling well, I was craving a set of good old-fashioned encyclopedias. 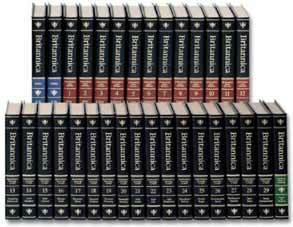 You know, those multi-volume sets, (Britannica is 32 volumes for 2006), that you maybe last saw in High School. I know, I know, there I had my laptop right on the bed with me- connected at high-speed to the Internet – and I wanted a set of $1400 encyclopedias. It’s that paper thing again. You see, no matter how many sites are on the web that tell me everything I could possibly want to know about Ernest Hemingway (for example), nothing beats being able to pull down a nicely bound volume of “GE-HI” to read about PaPa Hemingway. No links to click, no pop-ups, no slow-loading sites hosted on Angelfire or Tripod, no links that go nowhere; just a nice book I could have laid back with and absorbed myself in – without all the flash and flicker – for a good hour or more. And in a few hours if a taste of the life of Virginia Woolf calls my name – it’s as easy as “TA-WR.” Ahh, I had a craving in a bad way and had no fix. Clicking from site to site or surfing to, er, Wikipedia, just didn’t do it for me. I wanted the original thing, a true-blue set of tightly bound encyclopedias. Britannica or World Book – I’m not picky. A set of World Book encyclopedias runs 24-volumes and is a cool $1.085.00 (2010). Quite a bit less expensive than Britannica, but, truth be known, I’m fond of the World Book graphs, charts, full-color pictures and tiered-for-depth-of-interest articles. But heck, this last week I was craving a set so badly I would have settled for a supermarket set of Funk & Wagnalls. I guess it wasn’t the amount of information I was after, per se, it was the experience. I wanted to feel the book in my hands and turn the pages. (The paper thing.) I also wouldn’t have had to wonder if some ILoveHemingway.com website was put together on a whim by a 12 year-old who doesn’t get out enough. The world is at my fingertips, right on the keyboard, a click away….but sometimes it just doesn’t feel right. (And don’t even remind me that, “encyclopedias,” are all available in CD-ROM editions.) It’s the look on the shelf. The smell as I open a volume. The dark ink on the pages. The well-written entries. The feel of the paper. Surely I’m not the only one who, in 2006, says, “I want a set of encyclopedias.” The real thing. The real deal. On my shelf.